Valladolid is a charming colonial city, located in the centre of the Yucatan Peninsula. 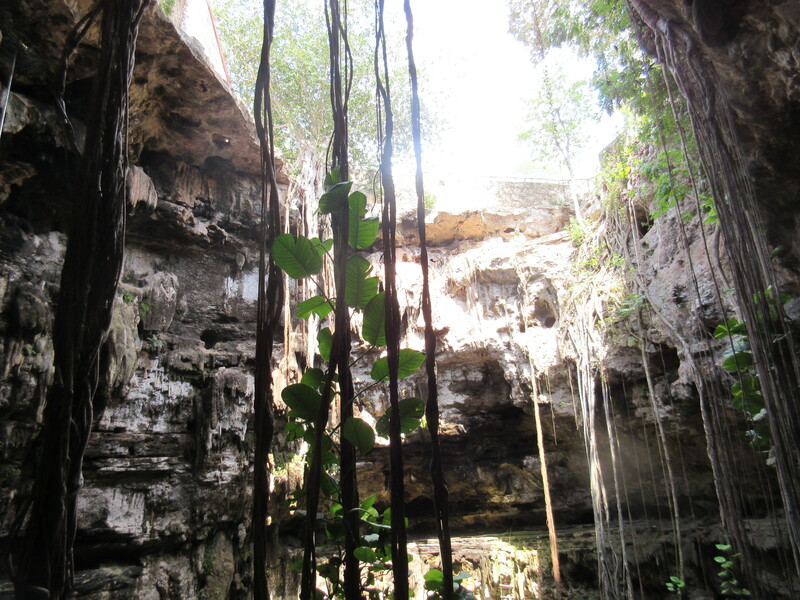 This city is a great base for exploring the many interesting and gorgeous cenotes in the surrounding area. 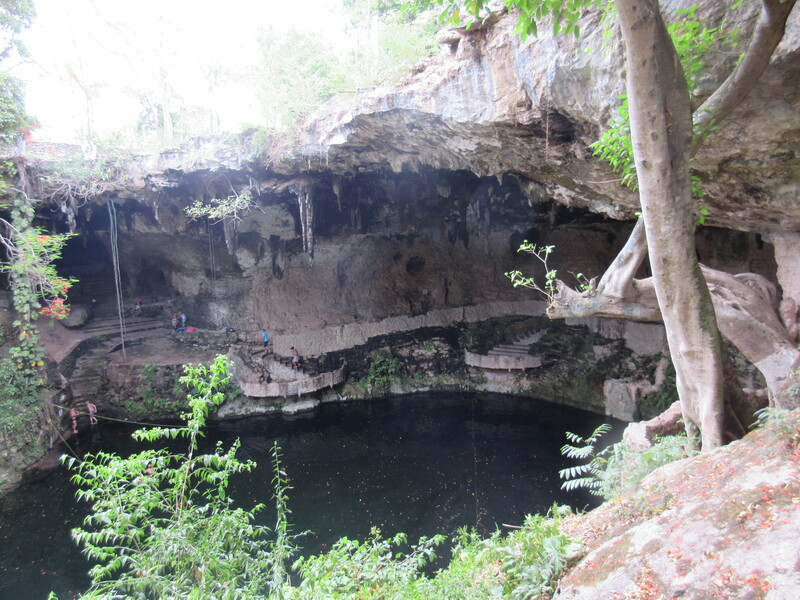 This cenote is located approximately 4 km south of Valladolid on Calle 54 at a quiet hacienda hidden down a long gravel road, very close to town. 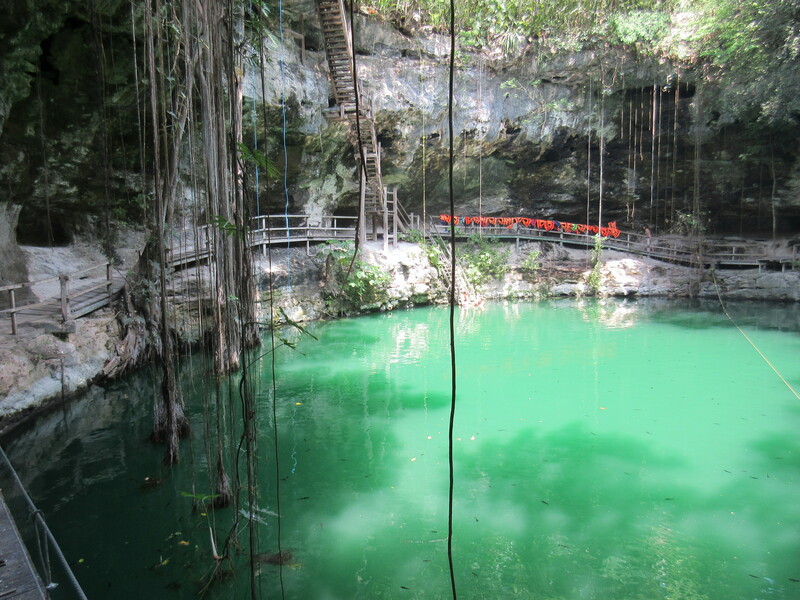 You can easily take a taxi or ride a bicycle to this cenote. If you are bicycle riding, there are multiple bike rental shops in Valladolid. If you’re staying at Hostel La Candelaria, they rent bicycles for 80 pesos per day or 15 pesos per hour. Bike south on Calle 54 and then make a right when you see the sign for the cenote, down a very bumpy, narrow and uphill gravel road, which leads to the hacienda and cenote. I took a taxi which costs 70 pesos one way from Valladolid. The cost is cheaper if you share with others or go with some friends from your hostel. When you are ready to go back to Valladolid, ask one of the staff in Spanish to call a taxi for you to get back to Valladolid, as taxis do not make regular stops here (say “Me puede llamar a un taxi?”). 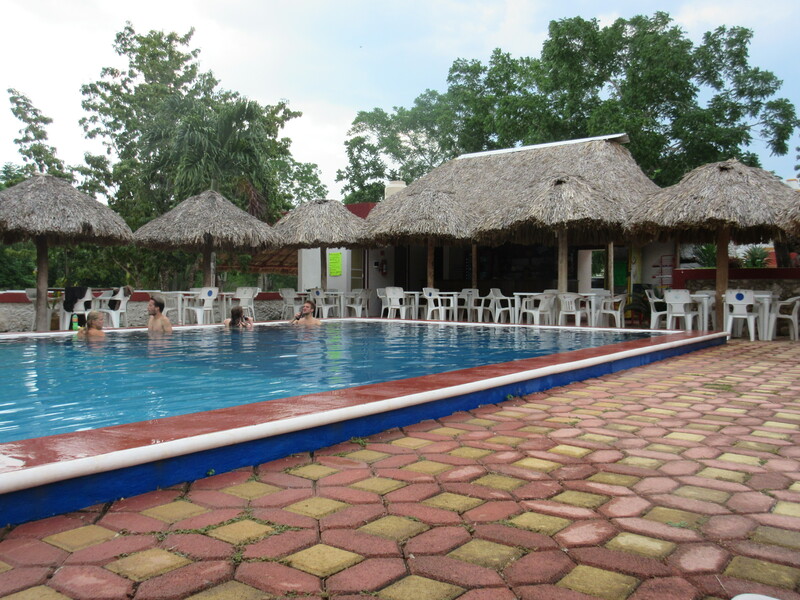 The entrance is 30 pesos which includes access to the cenote and pool/lounge area. There is a small bar here and local beers cost 30 pesos. 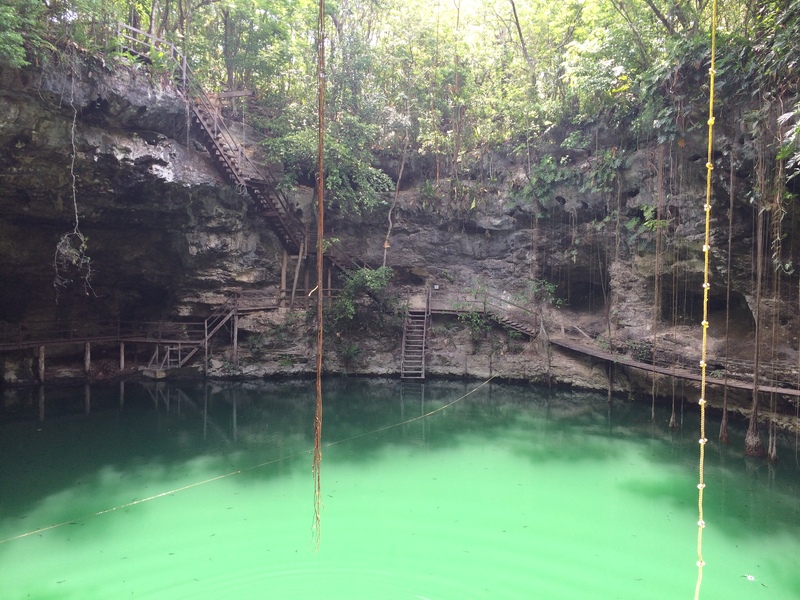 I visited this cenote with some new friends from the hostel I was staying at in Valladolid. This ended up being my absolute favourite cenote that I visited in Mexico! My friends and I were the only people there which created a peaceful, relaxing and magical atmosphere inside the cenote. 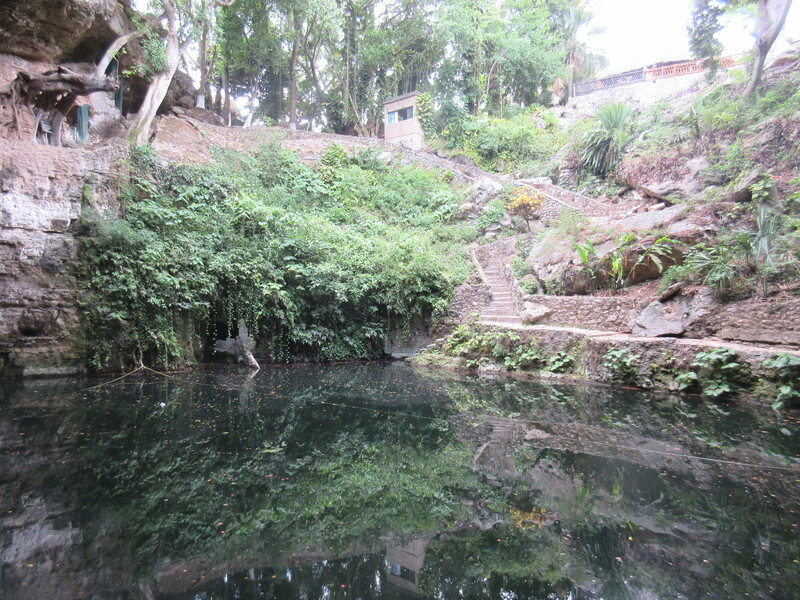 The cenote is located far underground after a long walk down spiral stone steps. 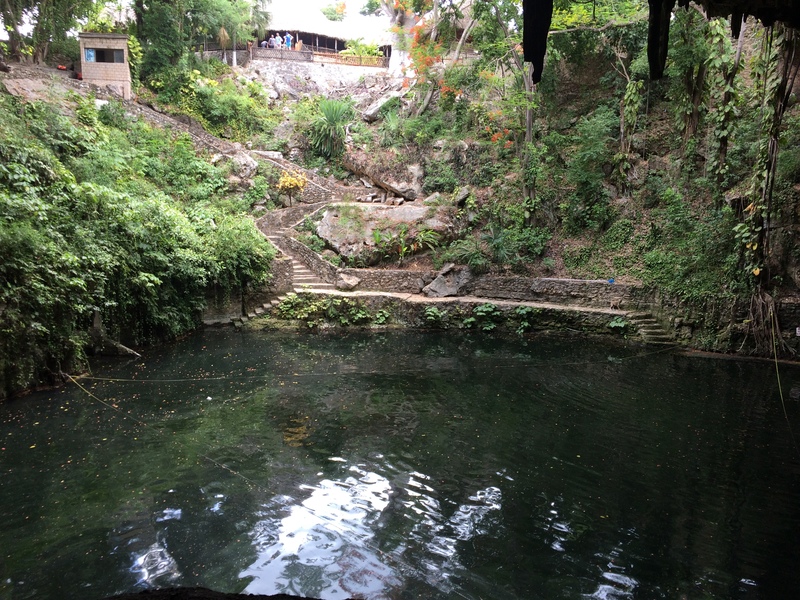 Upon arriving at the hacienda, you would never know that a cenote is there because it is so far underground and the entrance consists of just a small doorway at ground level. 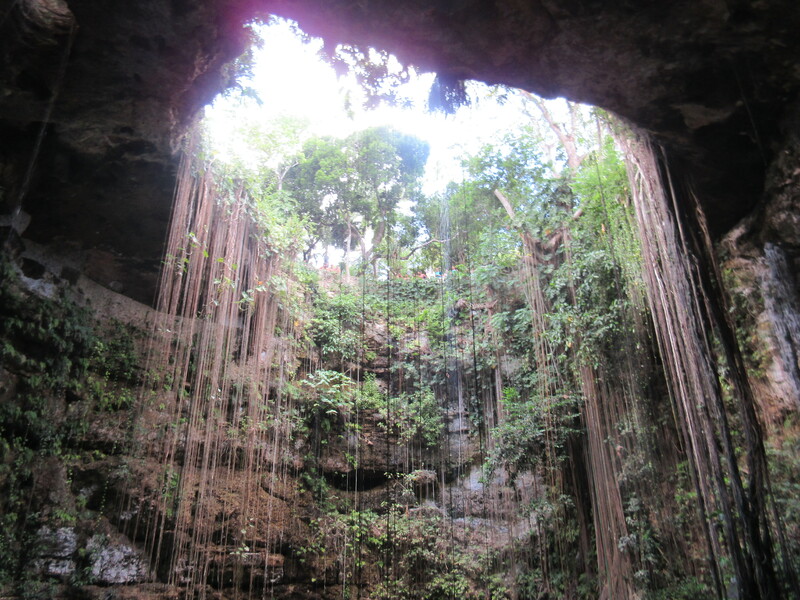 There is a large opening at the top of the cenote where tree roots and vines dip down to the fresh water. It is absolutely breath-takingly beautiful! Inside the cenote, there is also a rope swing which was so much fun to swing across and then jump into the refreshing and cool water. A staff member comes down in the cenote with you and supervises the rope swing. There are no lockers here but I felt comfortable and safe leaving my belongings on a rock ledge on the side of the cenote. 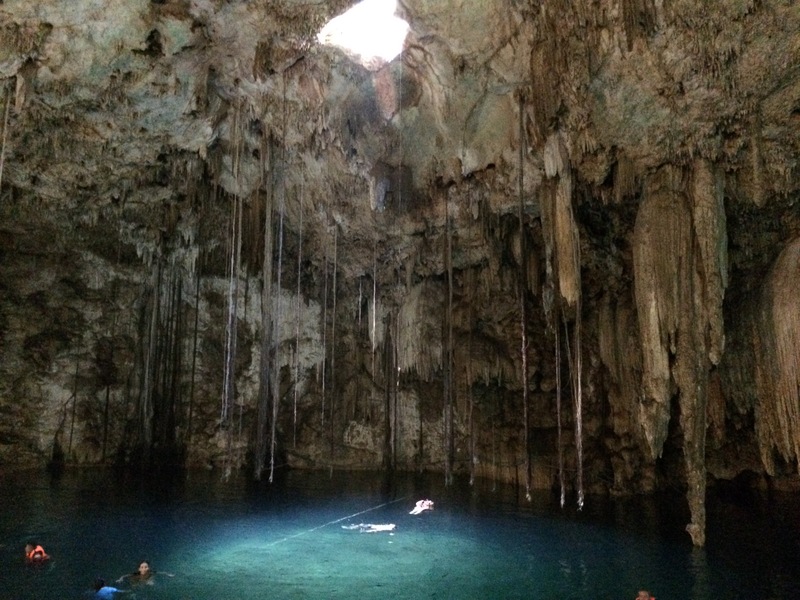 It was amazing to have the entire cenote to ourselves! 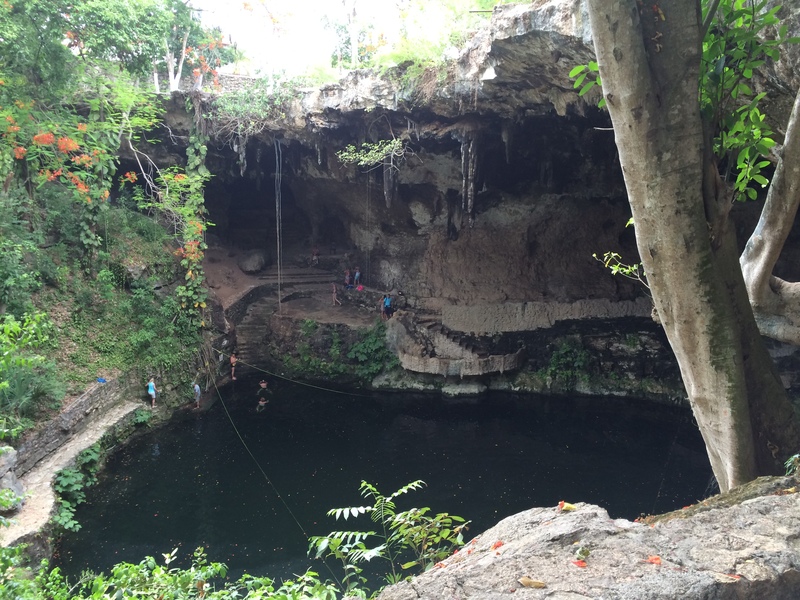 This cenote is definitely lesser known and off the beaten path, which I loved. When you’re finished swimming in the cenote, the hacienda grounds have an in-ground swimming pool surrounded by lounge chairs and tables, as well as a bar which serves cheap beer. You can easily spend an entire afternoon here, as I did, and it was beautiful. 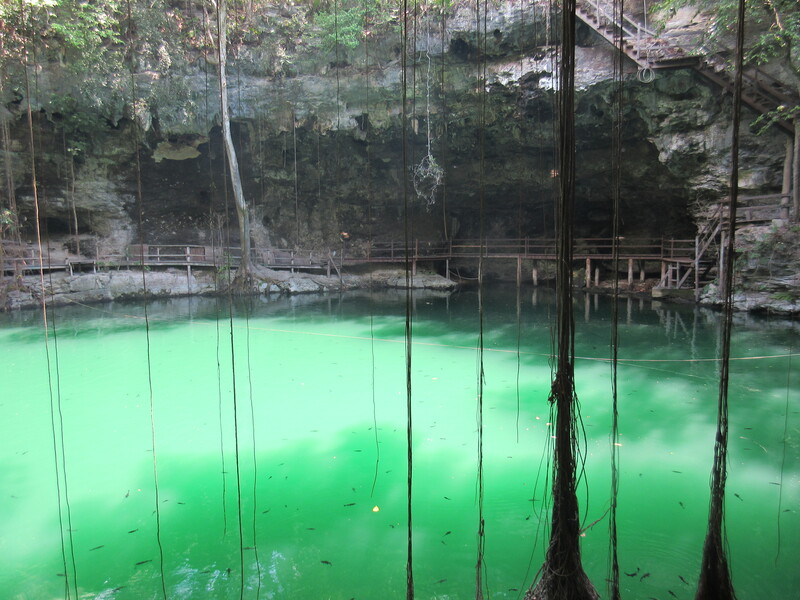 This cenote is not listed in any guidebooks, but it is the best one, in my opinion. 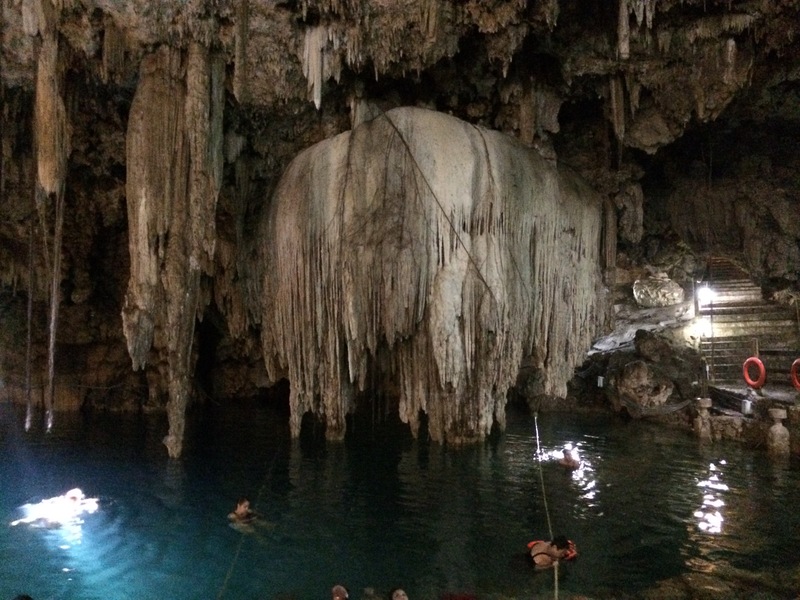 It is a hidden gem in the Yucatan and I hope it stays “undiscovered” and retains its magic. 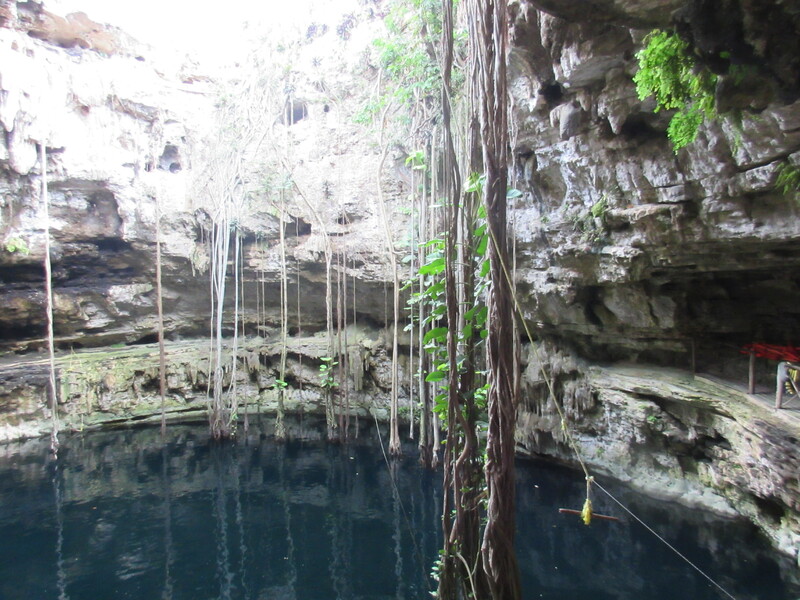 Both cenotes are located across the road from one another. They are situated just 7 km south of Valladolid down Highway 180 and then taking a left down the road towards the village of Dzitnup. Hostel La Candelaria in Valladolid provides you with a bicycle route map for how to get there via cycling. I would have cycled but in May, it was way too hot! I took a taxi with a couple of friends who I had met at my hostel, and it cost 70 pesos one way, which we split between the three of us. There are taxis waiting in the parking lot when you’re finished swimming in the cenotes. If there aren’t any taxis waiting, you can ask one of the staff members to call one for you. 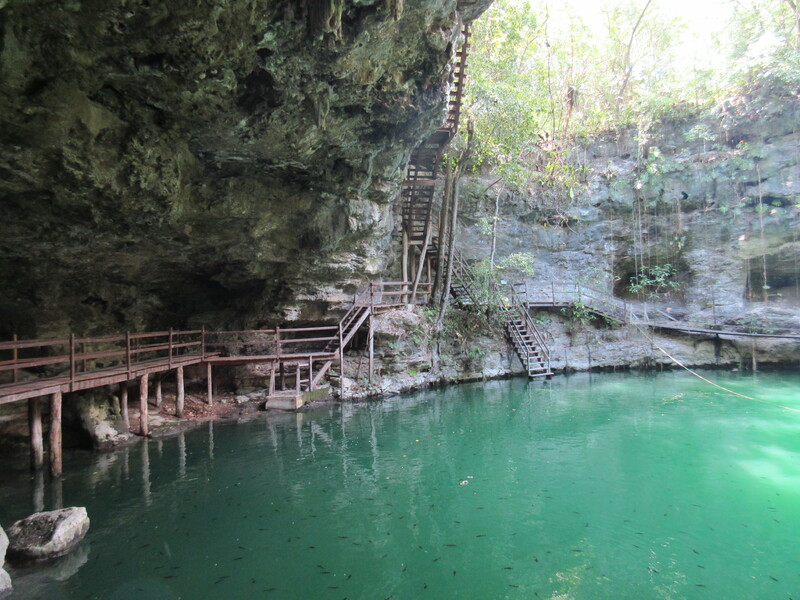 65 pesos entrance for each cenote. There are no lockers but you can leave your belongings on the side of the cenote on the rocks. 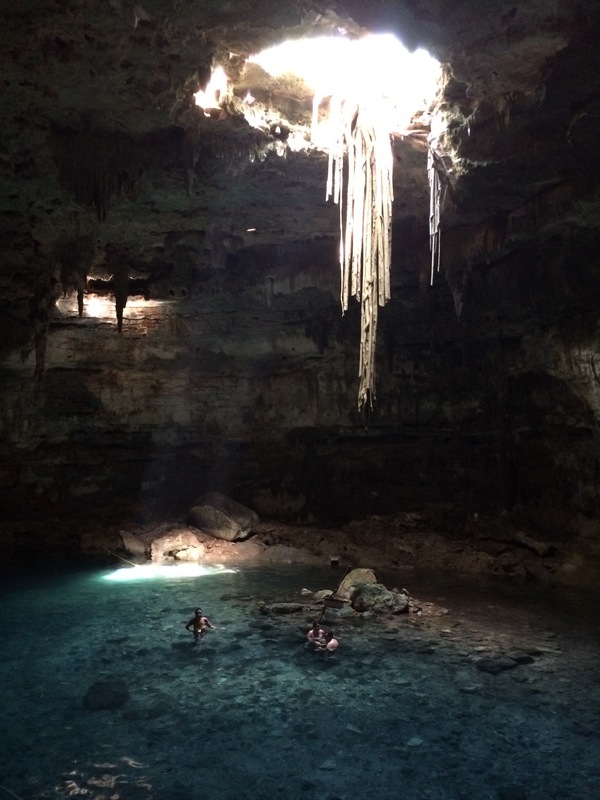 Both cenotes are located completely underground with a small opening at the top of the rock ceiling, allowing the sun’s rays to shine through down to the water below, with tree roots hanging through the opening. They are both gorgeous! There are stalactites hanging from the rock ceiling, and interesting rock formations, bats flying above your head and little black catfish swimming in the water with you. The water was cool and refreshing and if you are sitting on the edge of the cenote with your feet in the water, little fish will swim up and nibble the dead skin off of your feet. It felt weird and tickled a little! Once you start swimming, they leave you alone. 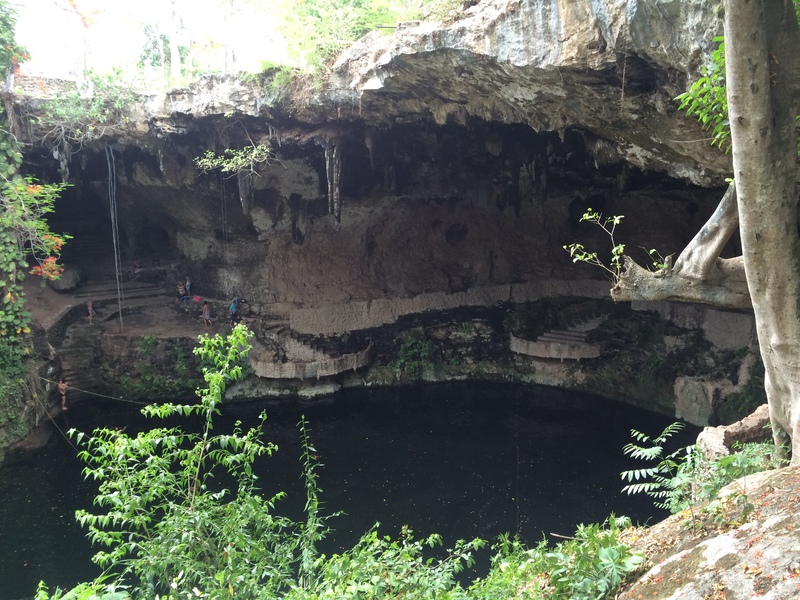 The water in Cenote Samula is shallower and there is a rock island in the middle where you can rest. 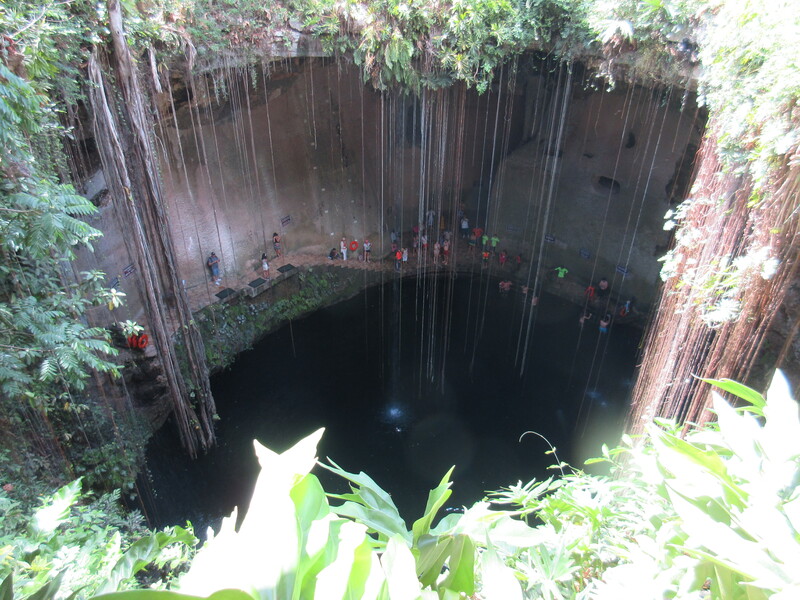 The cenote is circular and is a large open swimming area. 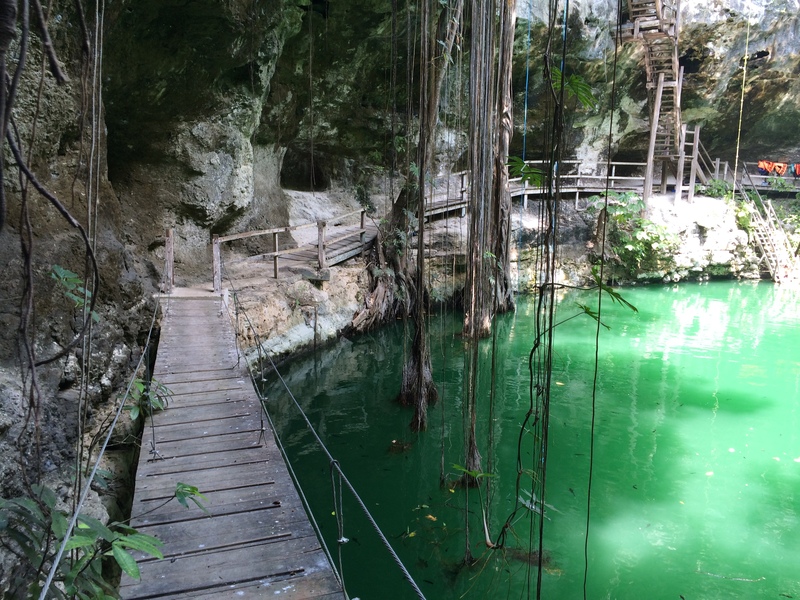 At Cenote Samula, you climb down a set of narrow wooden stairs that take you directly into the water. There is only a small flat area to stand before climbing down the steps, and you can leave your belongings there, since there are no lockers. Cenote Xkeken also consisted of a mostly open swimming area, but there were some areas of the cavern that were narrower and where you could swim around stalactites. Cenote Xkeken has a large area on the side of the cenote where you can leave your belongings. I visited the cenotes in the afternoon and it was more crowded than I was expecting. What I didn’t like about the area surrounding the cenotes, was how modernized and commercialized it was, complete with brand new washroom facilities, a full restaurant, and more concrete than trees and other natural foliage. 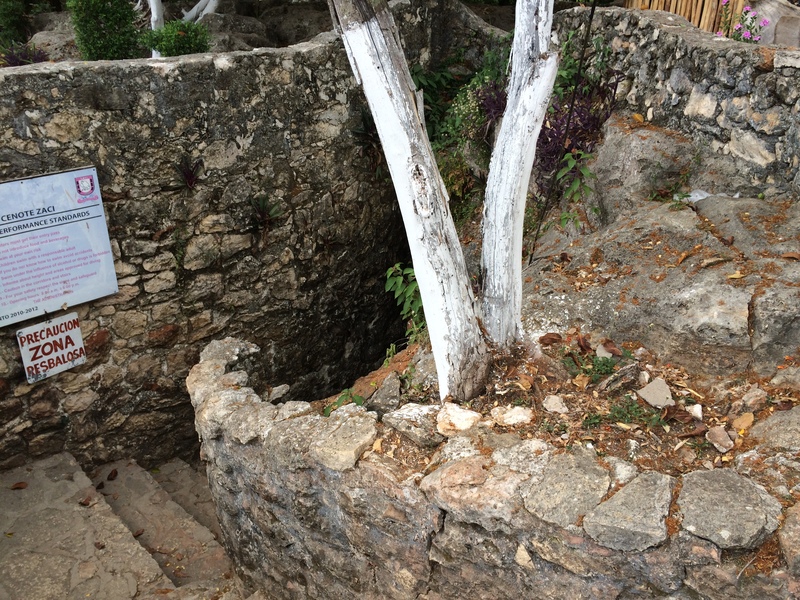 It was somewhat confusing and difficult to locate the entrance to the cenotes themselves. The paths guide you through a circular maze of vendor booths selling touristy souvenirs before you get to the cenote. I finally found a little path leading to the cenote after walking through this market-like area for a little while. 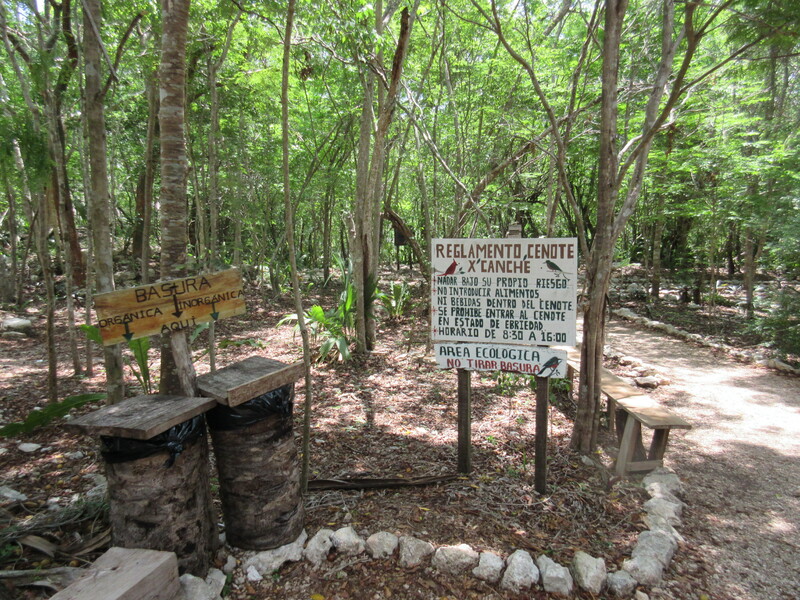 There were no signs telling you which path led to the cenotes. You basically have to walk around aimlessly and try walking down different paths until you find it. 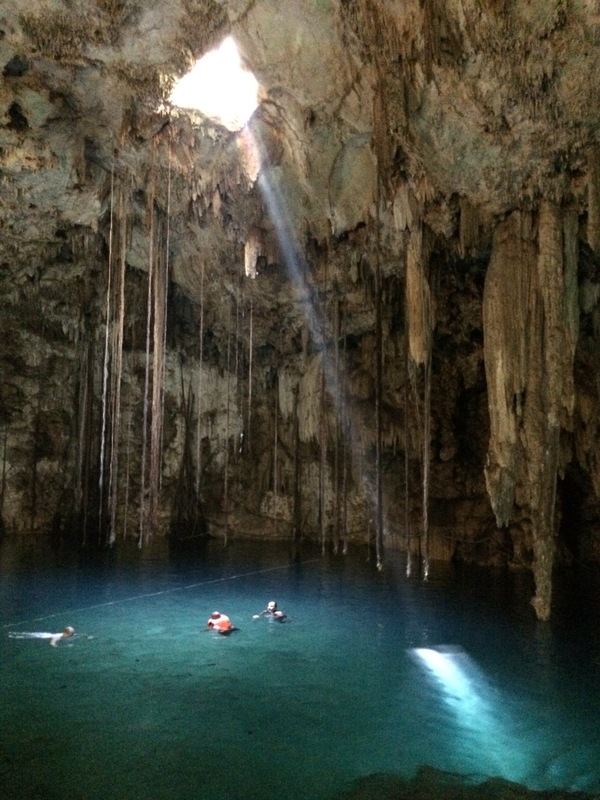 But once you get underground and see the beauty of the cenotes, it is worth it. I would definitely recommend visiting these cenotes and in hindsight, I would try visiting in the morning next time to avoid the crowds. Cenote X’Canche is located down a 1.5 mile gravel path starting from the entrance to the Ek Balam Ruins, just 20 minutes north of Valladolid. I visited Cenote X’Canche with friends from my hostel and we took a taxi colectivo from Valladolid (Calle 44 between 35 and 37 is where they line up and wait) for 50 pesos per person one-way. If you don’t have 4 people, you may have to wait a little while before the taxi driver leaves, as he will wait until he has enough people to fill his car. There are usually taxis waiting in the parking lot to come back to Valladolid, but if not, just ask a staff member to call one for you. 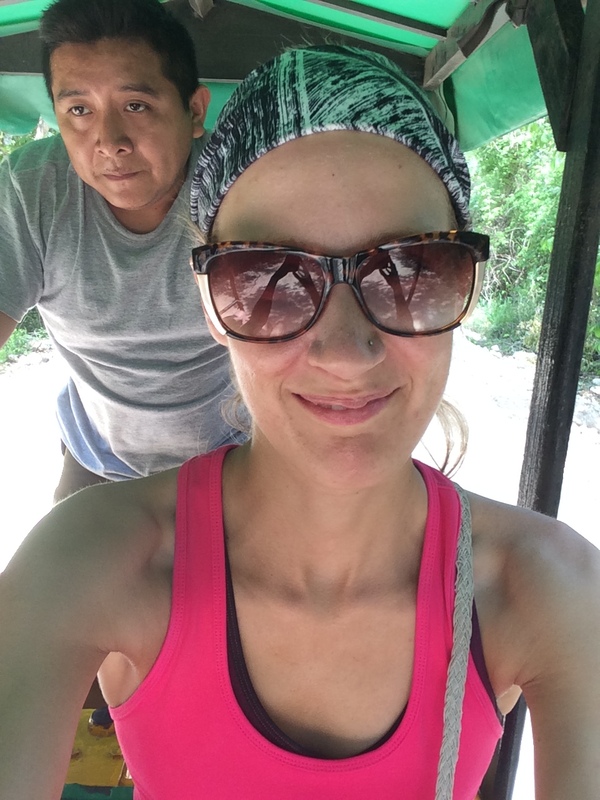 Once you are at the Ek Balam Ruins entrance, you can rent a bicycle or bicycle taxi for two people to get to the cenote. I opted for the bicycle taxi which was a great option, as they had just laid down some fresh sand on the path which would have been very difficult to bike through! Our driver was exhausted. 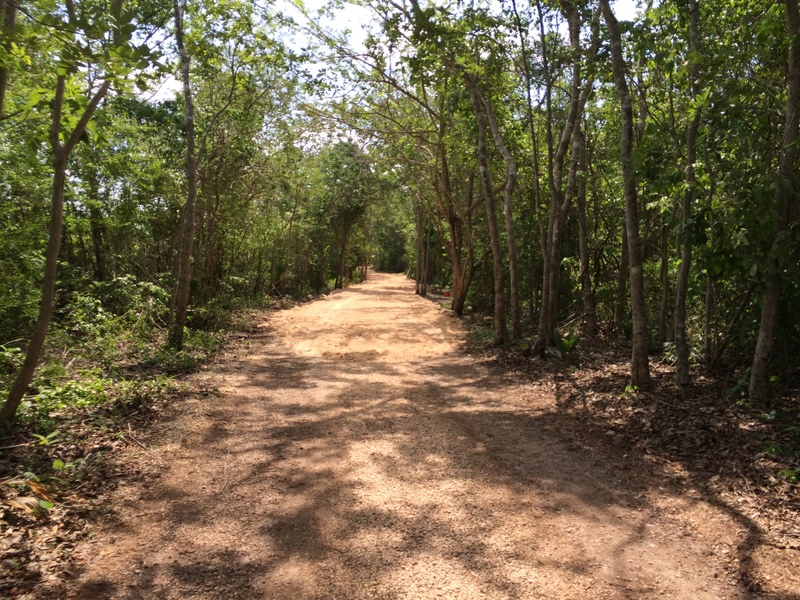 You drive down the sand path for about one and a half miles to reach the cenote. The bicycle taxi will wait at the cenote until you are finished and the same driver will take you back to the parking lot of the ruins. 30 pesos entrance, 70 pesos for a bicycle rental or bicycle taxi (two person). The cenote is managed and maintained by local community members, so your admission and bike rental supports them directly which is awesome. I love supporting and contributing to the local economy when I am traveling. Cenote X’Canche was absolutely gorgeous and was my second favourite cenote (my first favourite being Cenote Oxman) that I visited in the Yucatan. It is set in the middle of the jungle and is surrounded by dense foliage and unspoiled natural beauty. Very little has been done to modernize the area, which made it more rustic, natural and enjoyable. There are washrooms and changing areas (and lockers for rent), but they are very basic wood stalls. 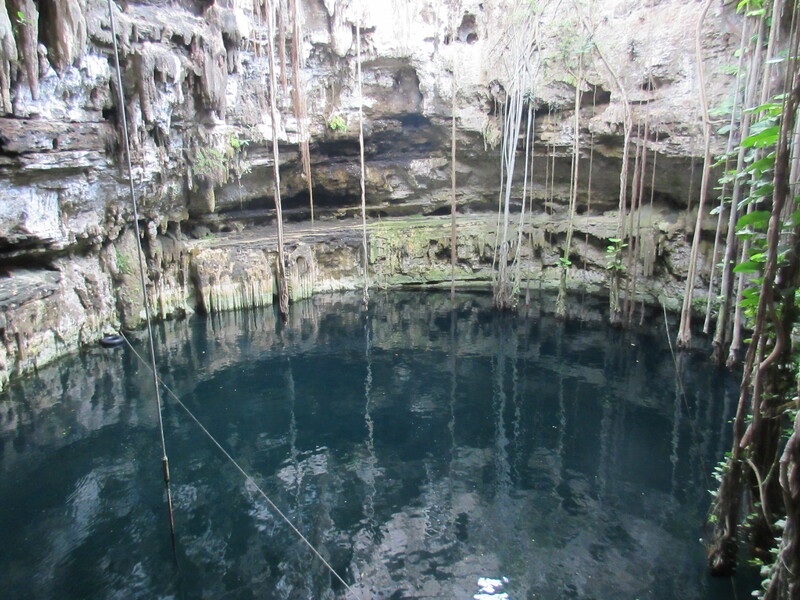 The structure of the cenote is similar to that at Cenote Oxman, with it being circular and having a large opening at the top where tree roots and vines dangle from the ground above to the water below. 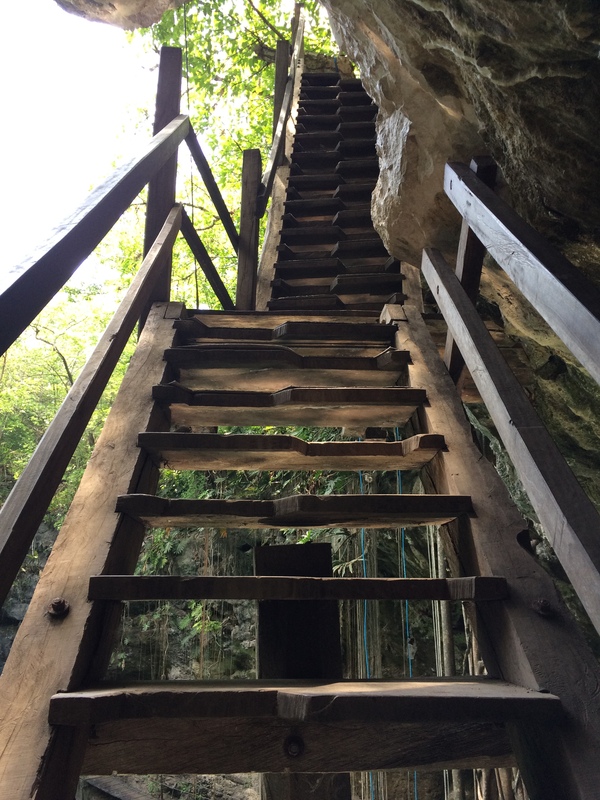 To get down to the cenote, you walk down a set of very steep wooden stairs. 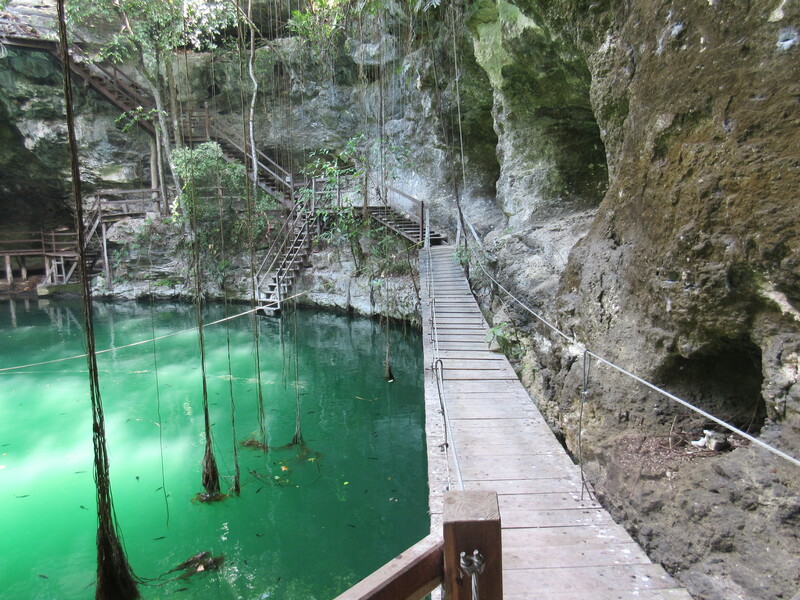 Once you are down to the water’s level, there is a wooden boardwalk and mini suspension bridge that encircle the interior of the cenote, hugging closely to the rock walls. The water is a beautiful turquoise colour and is completely clear. There are a lot of small black catfish swimming in the water, but they swim away from you when you get near them. The fish freaked me out a little bit, but don’t worry, they won’t bother you. After climbing the ruins at Ek Balam, the water was a cool and refreshing treat. Similar to many other cenotes, there are ropes tied from one end of the cenote to the other, in order to stand or lean on to take a break from treading water. My group and I were the only ones there at the time, which added to the peacefulness and magical atmosphere of the cenote. I hope this cenote remains a lesser known and less “discovered” cenote, so that it retains its natural beauty and magical atmosphere. 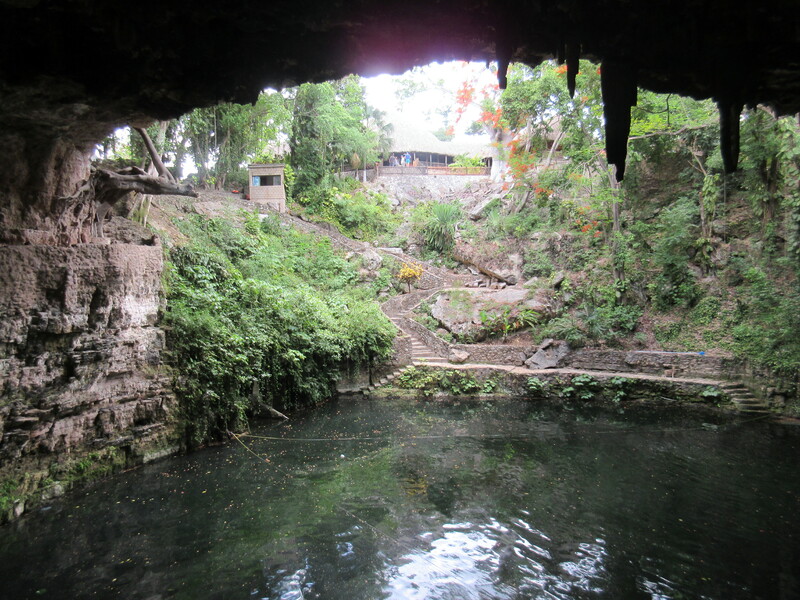 Cenote Zaci is located at Calle 36 between Calles 37 and 39. It is located in the middle of Valladolid, Mexico. 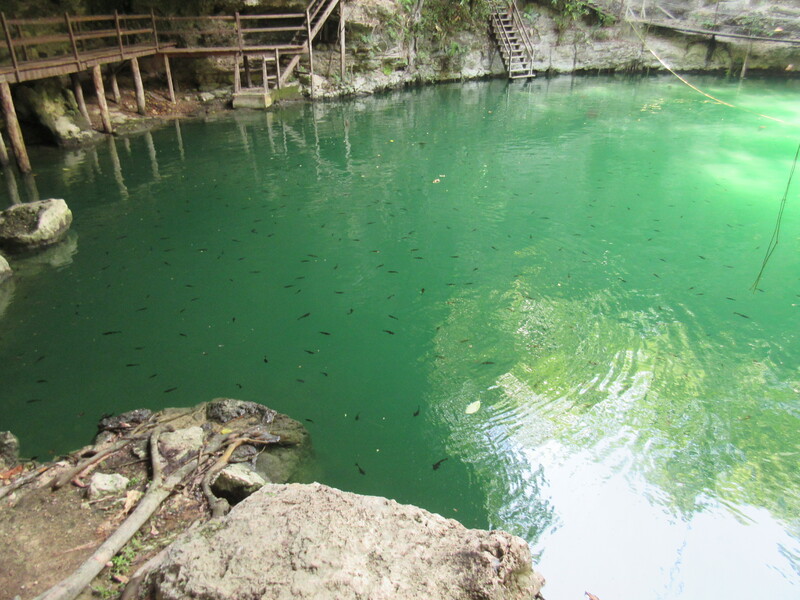 Cenote Zaci is easy to walk to from most central areas of Valladolid. It was located only 5 blocks from my hostel (Hostel La Candelaria). You could also bicycle here (Hostel La Candelaria rents bikes for 80 pesos per day and 15 pesos per hour). 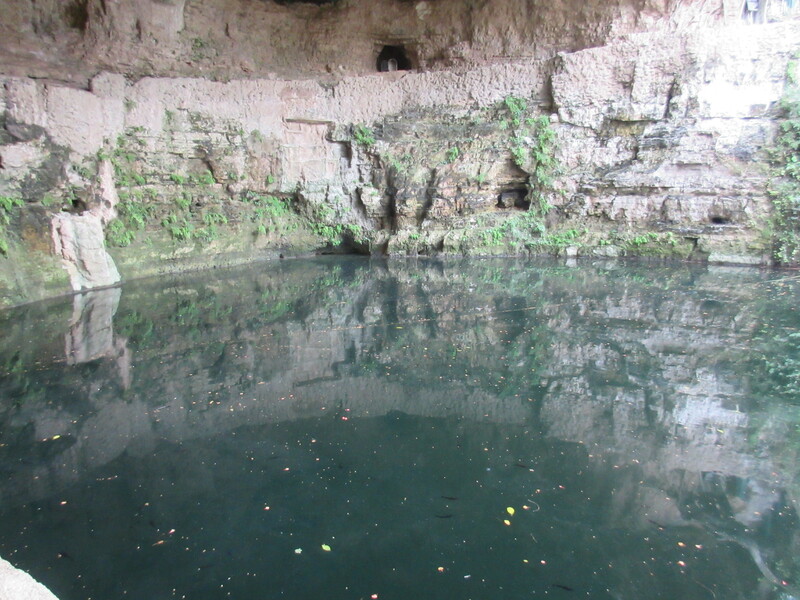 I visited this cenote on my own during the afternoon of the first day that I had arrived in Valladolid from Tulum. There are no washrooms or changing rooms and no lockers, so I suggest changing into your swimsuit before you get there and just wearing your clothes over your swimsuit. I was the only person at the cenote and felt safe leaving my belongings on the side. I walked down some stone steps and then into the cenote, which is a massive hollowed out cavern that is largely open to the sky. There is lush greenery on the opposite side of the cenote, climbing all the way up a steep hilly incline to the ground level. 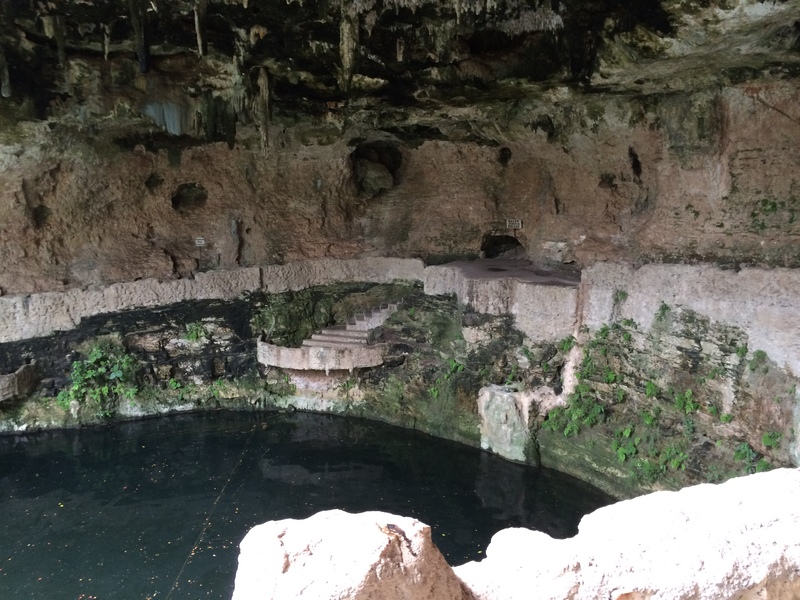 It was absolutely beautiful and amazing that this cenote was located in the middle of a city! There were stone steps leading right down to the water’s edge. 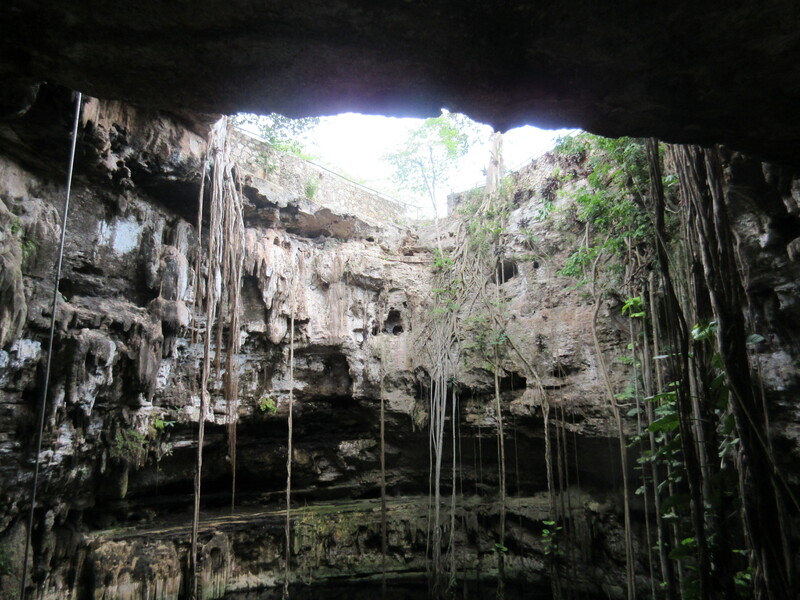 One side of the cenote is a rock wall with stalactites and stalagmites hanging from the rock ceiling and the other side is a grassy green hill leading up to the ground level. The water was quite murky and had lots of leaves and tree branches floating in it, but I swam anyways. It was refreshing, and a welcome break from the May heat in the Yucatan! 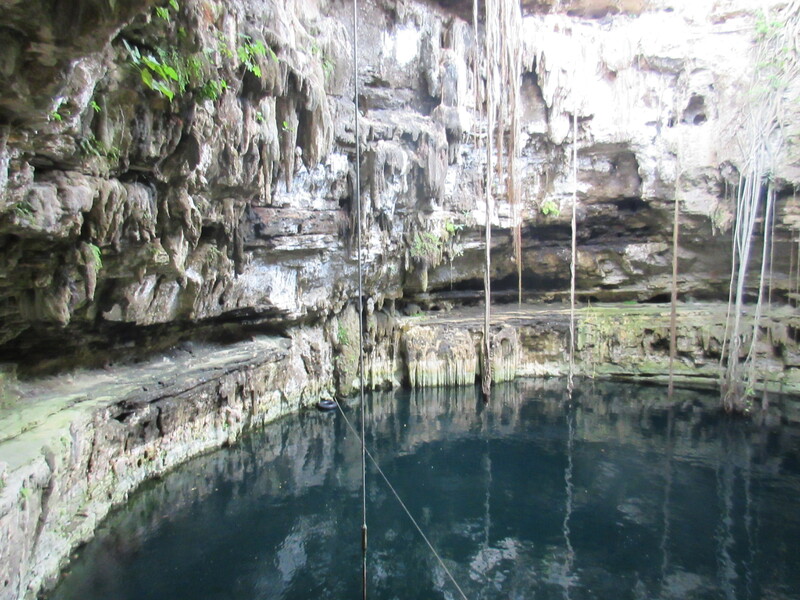 There were ropes strung from one end of the cenote to the other to hang on to if you get tired of swimming. The only thing that freaked me out a little, was that there were so many little black catfish in the water, but I couldn’t see exactly where they were because the water was so unclear! 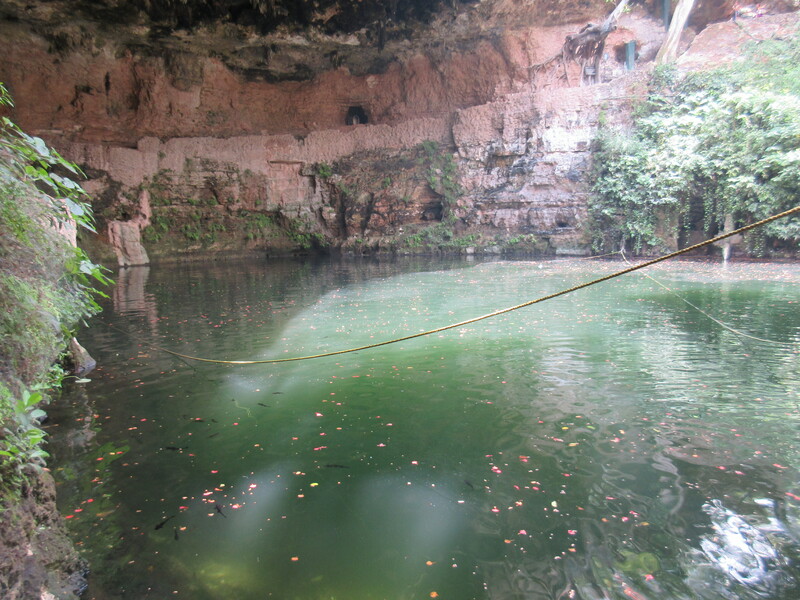 I was the only one there at the cenote when I went, which was nice. 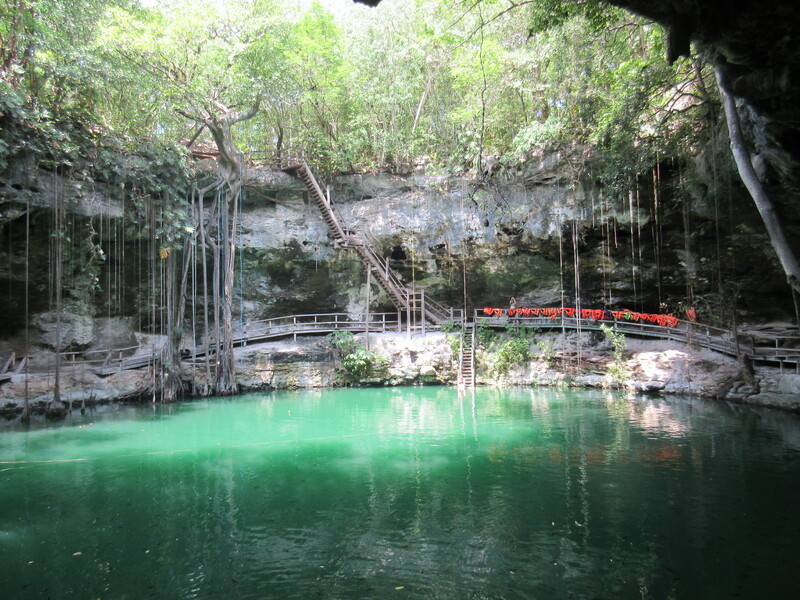 The cenote itself is large, impressive and absolutely beautiful. 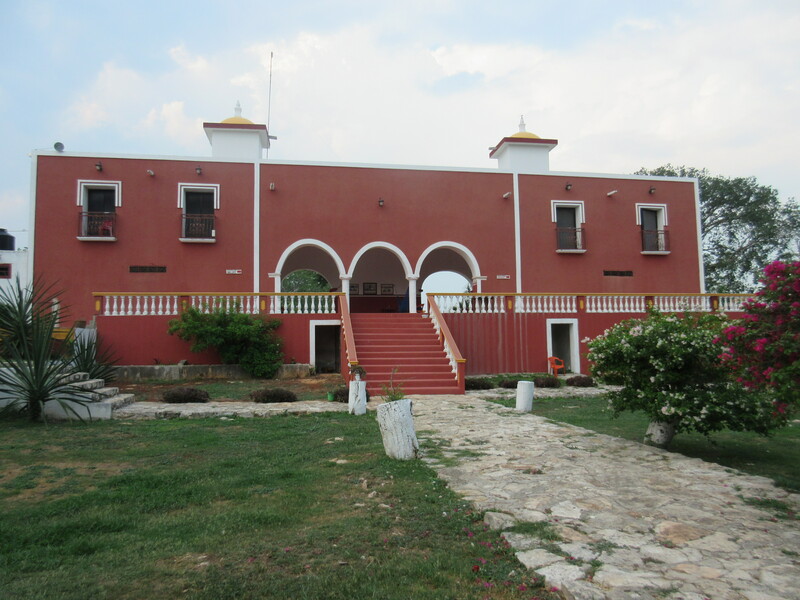 I would recommend checking it out when you are in Valladolid. 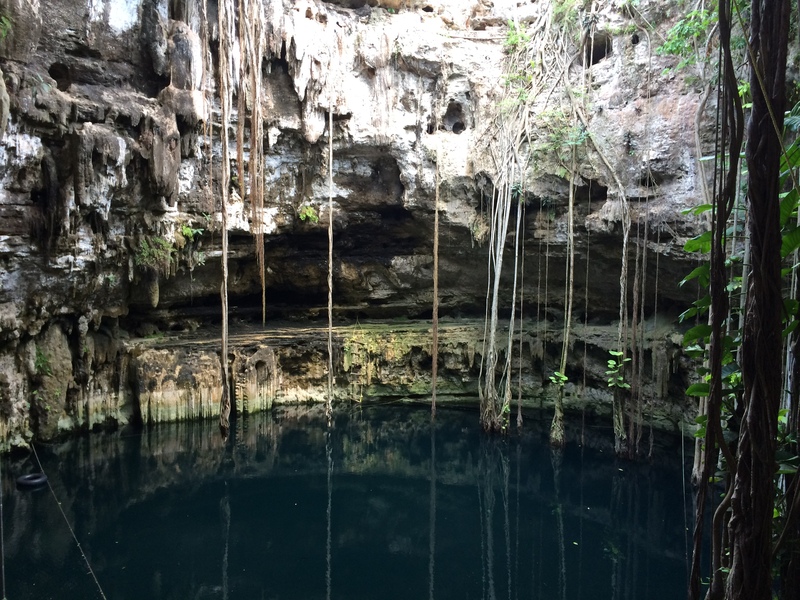 Cenote Ik’Kil is located about a 5-7 minute drive from Chichen Itza just off of the Valladolid-Merida Highway between the towns of Piste/Chichen Itza and Xcalacoop. I had visited Chichen Itza in the morning with friends that I had met at the hostel I stayed at in Valladolid. Following the ruins visit, we took a taxi for 70 pesos (split between all four of us) to the cenote. When we wanted to return to Valladolid, we took a another taxi back for 250 pesos (split between the four of us), as there were no buses or colectivos leaving from the cenote’s parking lot. I imagine you could also take a second class bus from Valladolid to Piste and then taxi to the cenote, back to Piste or Chichen Itza and then get a colectivo or second class bus back to Valladolid. Costs: Entrance was 70 pesos, lockers were 30 pesos. 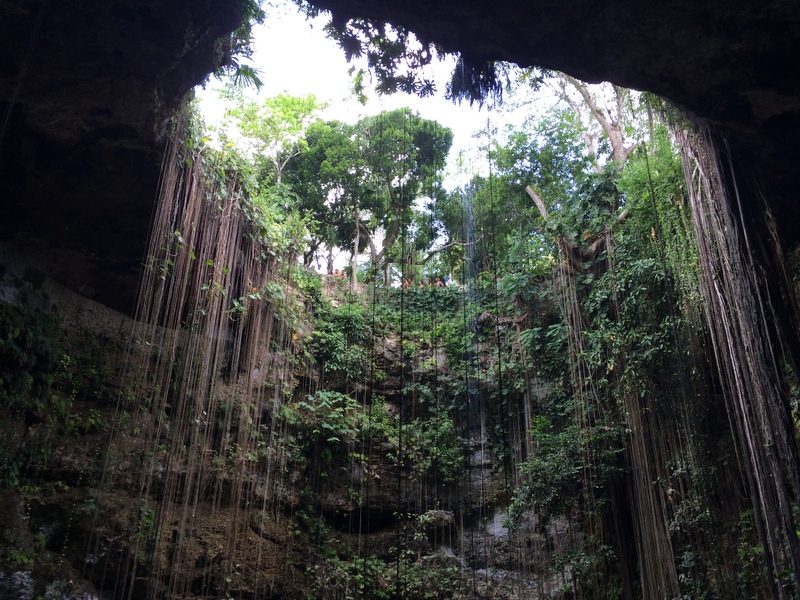 The cenote itself is absolutely beautiful and has lots of tree roots and vines hanging from the ground above to the water below. There are black catfish swimming around you. 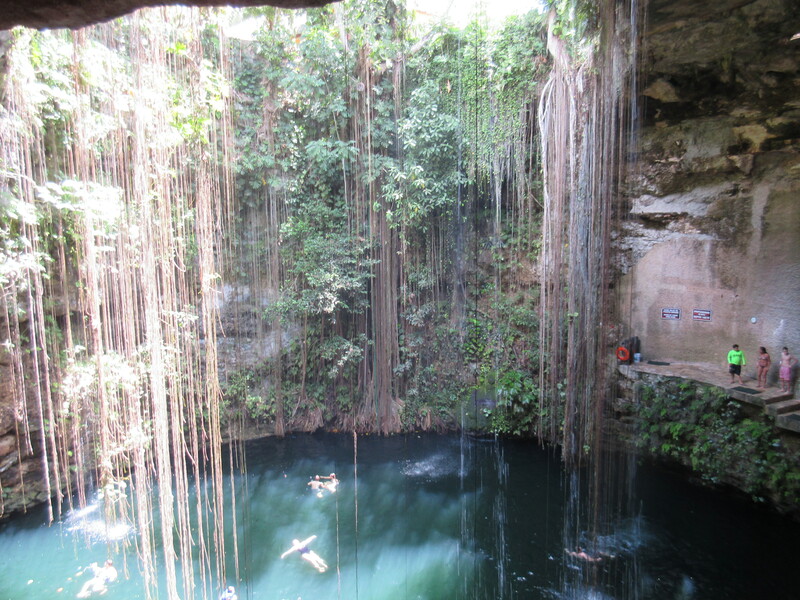 The cenote was pretty crowded when I visited and it is very touristy and commercialized, which I felt detracted from the cenote’s natural beauty, peacefulness and magic. A lot has been done to modernize the area surrounding the cenote, with large changing rooms, washrooms, lockers and a full service restaurant. I prefer to visit cenotes that are further off the beaten path and surrounded by the unspoiled natural beauty of the jungle. Once we made our way through the crowds of people and down to the water’s edge, we had to wait in line in order to actually go for a swim. There was also a higher ledge where you can jump off into the water, but there was a long line-up for that one as well. Once I got my turn to enter the water, I could barely swim without touching or bumping into someone else. It was packed with people. Visiting this cenote was definitely not a very relaxing or peaceful experience, and it was probably my least favourite cenote that I visited, based solely on the atmosphere. 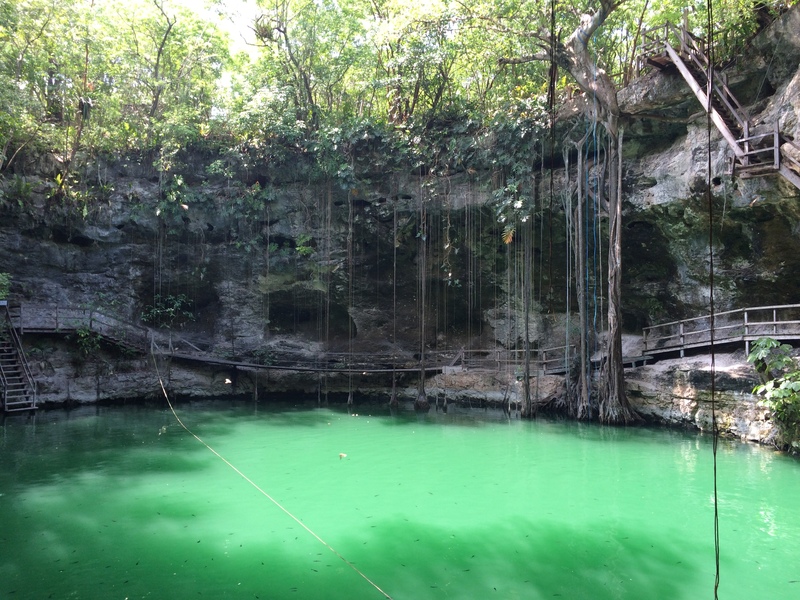 The cenote itself is absolutely gorgeous! Perhaps the atmosphere would be different in the morning when they open (I went during midday which is probably a busier time). 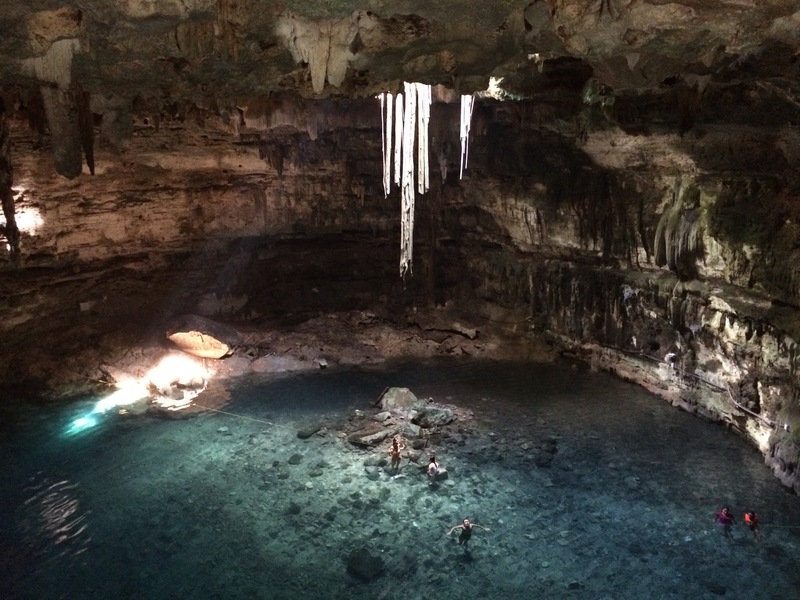 If you plan on visiting this cenote, I would recommend getting there early, instead of waiting until the middle of the day like I did, in order to beat the crowds and be able to admire the beauty of this cenote in a more peaceful setting. 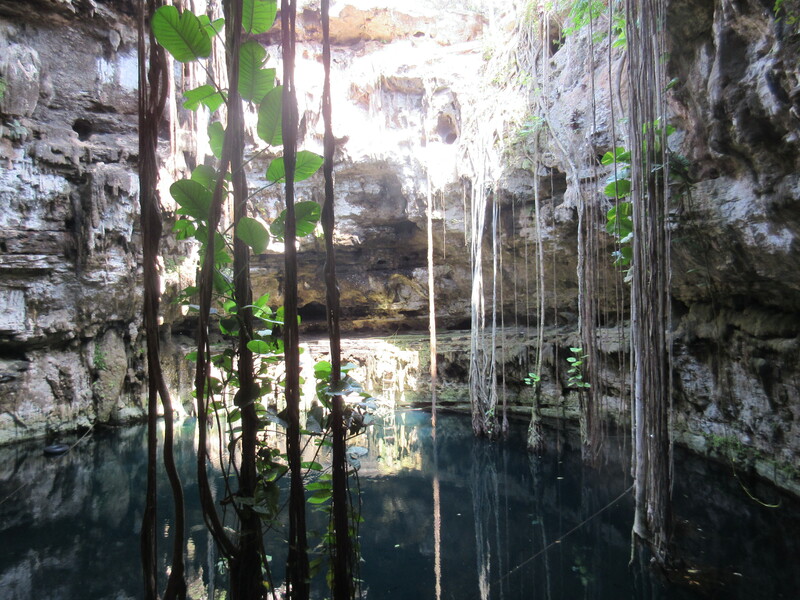 As you can probably notice, I am a little bit obsessed with cenotes. How can you not be?! They exude such gorgeous natural beauty and they have a lot of history and sacred meaning to the ancient Mayas in the Yucatan. They are fascinating to learn about and admire in person! 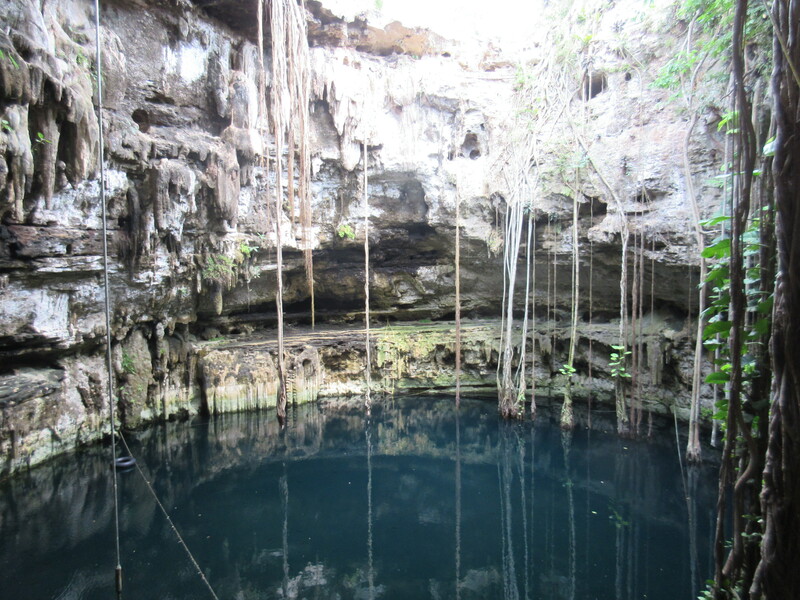 I am excited to keep exploring the cenotes of the Yucatan; re-visiting my favourite cenotes, while discovering new ones. 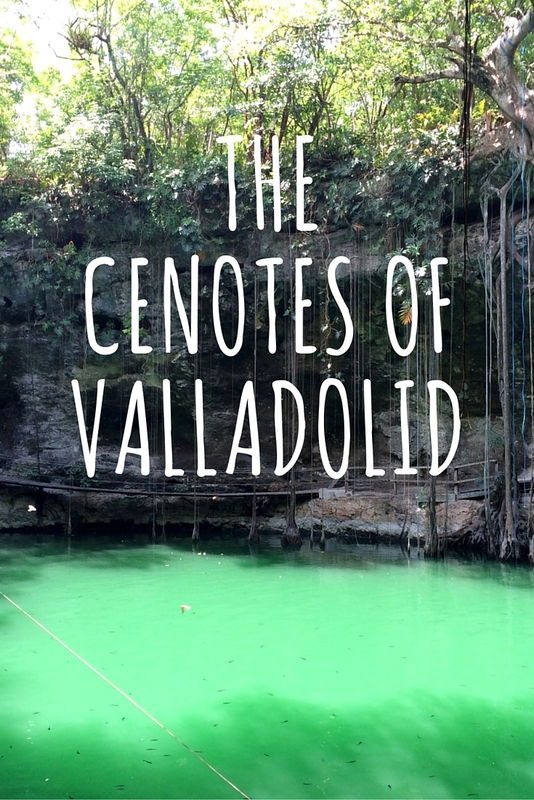 Which cenotes have you visited in the Valladolid area? Do you have any suggestions for other ones that I should visit? 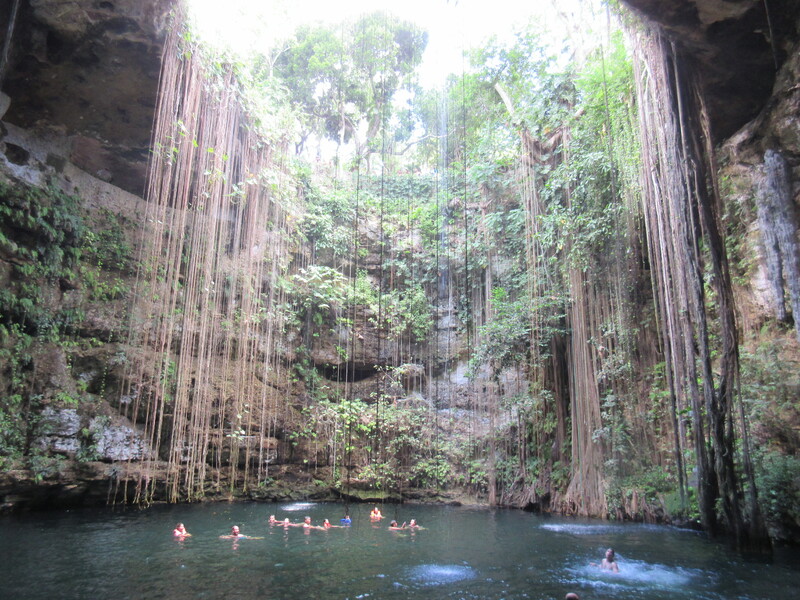 What do you love most about cenotes? Thank you so much for putting all this useful and well-written information together! 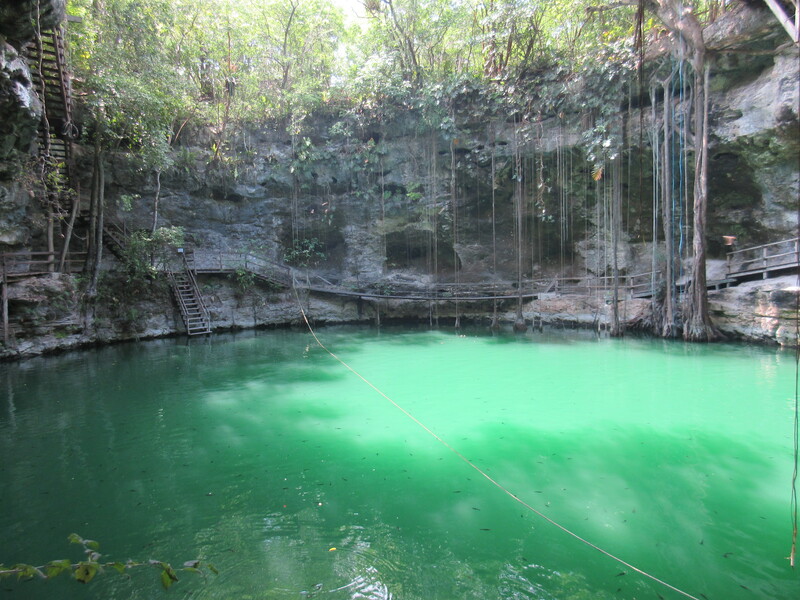 We’re in Valladolid now and will follows your steps to discover the cenotes! 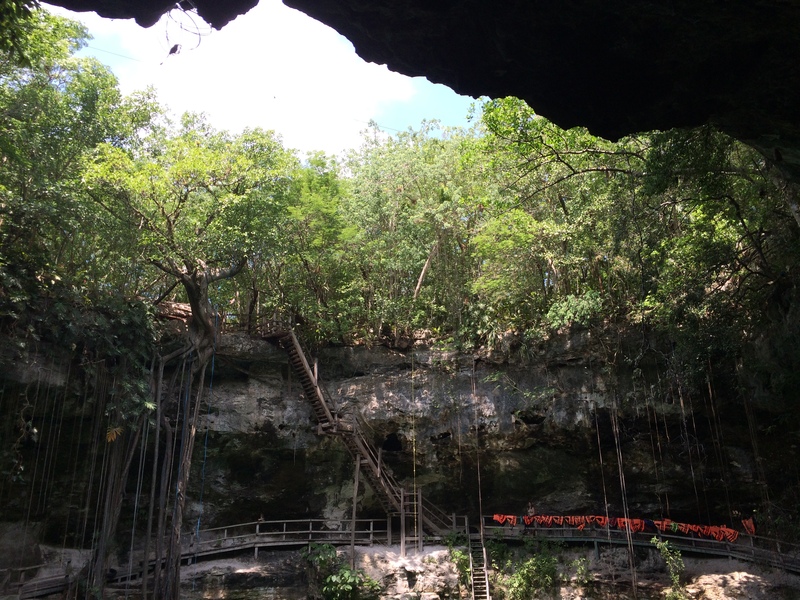 After reading this blog we visited Cenote Oxman as our first Cenote. I agree that is the best in the Yucatan Peninsula. As of June 2018, the price had gone up a bit but was still less than 100 pesos a person. It is 15 meters (45 feet for us, Americans) deep, so yes! They have plenty of life jackets and do not charge to use them. Hi, I'm Brittany, a 24 year old Canadian minimalist who craves new experiences, adventure and exploration. Follow me on my journey of simple living, as I pursue my passions and purpose, appreciate the little things in life, learn about our beautiful world and travel as often as I can. I hope this blog inspires you to live simply, healthily and frugally while overcoming fears and barriers to exploring the world more often. I will show you how to simplify your life, save money, plan and pack for your travels, and travel on a budget, solo, off the beaten path, slower and independently. I am currently living and working in Stonewall, Manitoba, Canada. Where Am I Traveling Next? November 12, 2015 - Mexico (Tulum, Valladolid, Merida, the Ruta Puuc and Campeche) for 17 days.